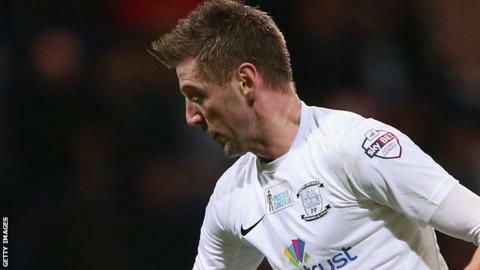 Paul Gallagher's second-half hat-trick for Preston left Shrewsbury on the brink of relegation from League One. Lee Holmes headed in Gallagher's cross to put the hosts ahead and Bailey Wright volleyed in a second from the edge of the box. Shaun Miller rounded keeper Declan Rudd to make it 2-1 before Gallagher steered home Stuart Beavon's cross. Gallagher then fired in from the spot and direct from a free-kick, after Luke Summerfield headed in for the visitors. Preston were awarded a penalty after Alan Browne was brought down in the area by Joe Jacobson. Shrewsbury, who are 23rd in League One, are now six points from safety and will need to win their last two games to have any chance of staying up. Preston are level on points with third-placed Rotherham having already booked their place in the play-offs. "I think sometimes you've just got to hold your hands up when you're beaten by a better side. "We're right up against it now. It's not mathematically certain yet but it's a case of winning two games and hope everyone loses theirs. "Obviously it's going to be unbelievably difficult, but we've got to do better than we've done today." Match ends, Preston North End 5, Shrewsbury Town 2. Second Half ends, Preston North End 5, Shrewsbury Town 2. Attempt missed. Paul Gallagher (Preston North End) right footed shot from the left side of the box is close, but misses to the right. Corner, Preston North End. Conceded by Ryan Woods. Attempt missed. Chris Humphrey (Preston North End) left footed shot from the right side of the box is too high. Shaun Miller (Shrewsbury Town) wins a free kick in the attacking half. Bailey Wright (Preston North End) wins a free kick on the right wing. Goal! Preston North End 5, Shrewsbury Town 2. Paul Gallagher (Preston North End) from a free kick with a right footed shot to the bottom left corner. Foul by Luke Summerfield (Shrewsbury Town). Goal! Preston North End 4, Shrewsbury Town 2. Luke Summerfield (Shrewsbury Town) header from the centre of the box to the bottom left corner. Assisted by Paul Parry with a cross. Foul by Jon Taylor (Shrewsbury Town). Shaun Miller (Shrewsbury Town) wins a free kick on the right wing. Substitution, Preston North End. Josh Brownhill replaces Lee Holmes. Luke Summerfield (Shrewsbury Town) wins a free kick in the defensive half. Corner, Shrewsbury Town. Conceded by Jack King. Attempt missed. Shaun Miller (Shrewsbury Town) header from the centre of the box is close, but misses to the left. Substitution, Shrewsbury Town. Luke Summerfield replaces Dominic Iorfa. Goal! Preston North End 4, Shrewsbury Town 1. Paul Gallagher (Preston North End) converts the penalty with a right footed shot to the bottom left corner. Penalty Preston North End. Alan Browne draws a foul in the penalty area. Penalty conceded by Connor Goldson (Shrewsbury Town) after a foul in the penalty area. Attempt blocked. Asa Hall (Shrewsbury Town) right footed shot from outside the box is blocked. Corner, Preston North End. Conceded by Dominic Iorfa. Goal! Preston North End 3, Shrewsbury Town 1. Paul Gallagher (Preston North End) left footed shot from the centre of the box to the bottom left corner. Assisted by Stuart Beavon with a cross.